Parking: The walk starts from the car park at the start of the Ingleton waterfalls trail (grid reference SD 695 731) - There is a charge to enter the walk, which goes to help with the upkeep of the walk as most is on private land. There is other parking available in Ingleton. Facilities / refreshments: Pubs and cafés in Ingleton. There is also a refreshment hut and café en-route. The walk starts from the car park outside the Tourist Information Office and Ingleton Library. This is the site of the old Ingleton railway station. Whilst the steam trains themselves have long since gone, the early part of the walk is in the shadow of the large Victorian railway viaduct, a long standing reminder of a bygone era. Follow the green signs for the village centre out of the car park in the direction of the viaduct. Upon reaching the road out of the car park, turn right and go immediately under the railway bridge. Follow this road for about one hundred yards past Bank Hall Close, then take the first left heading downhill following the large brown sign for "Waterfalls Walk". At the bottom of this short street, follow the road around to the left crossing over the River Doe by the guest house. Continue along the road over the River Twiss (the Rivers Twiss and Doe merge a few yards further downstream to form the River Greta), and then turn right into road leading past a black and white café heading for the start of the Ingleton Nature Trail. This right turn is signed Ingleton Waterfalls Walk. A hut a hundred yards down this lane is where you pay to go around the walk. The walk is nearly all on private land and a small fee charged is to maintain the paths around the walk. Just past the hut there is another car park where you could also park to start the walk from instead of in the village centre. There is a small fee per car, but this includes all the occupants, thereby making it cheaper if you have a large number of occupants in the car. The path to the falls leaves the far end of the car park and is well signed. After a couple of hundred yards just prior to the first kissing gate, there is a map showing the layout of the falls ahead. Go through the kissing gate and continue ahead along the well defined path. The path keeps to the side of the river and slowly starts to climb, before going through a metal gate. In Autumn when leaves are on the path and when wet or in icy winter, the path can be very slippery in places. The path continues alongside the river up the tree-lined Swilla Glen. After about three-quarters of a mile, the river is crossed by a footbridge and the path continues up the right-hand bank. Continuing on the path, a viewpoint is quickly reached looking across at Pecca Falls. The path carries on towards these falls and again crosses back across the river directly in front of the falls. Turn right immediately over the footbridge and follow the path up the side of the falls. As height is gained, more and more impressive falls appear in the steep sided gorge. At the top of these falls the path turns right through a wooden gate. Continue ahead past a green hut selling refreshments (open most of the year) and follow the green "Waterfalls Walk" sign stating "Thornley Force 1/3 mile, Beezley". The path now enters more open countryside as compared to the tree-lined earlier part of the walk. After a few more minutes Thornton Force (as opposed to Thornley on the sign) is clearly visible ahead. This waterfall is very impressive, even from a distance, but this time is one single fall of 15 metres as compared to the various falls that made up Pecca. The path goes along the left-hand side of the falls and climbs up alongside it, before continuing on to meet yet another footbridge. Go over the footbridge across the field and up to the gate in the wall. Go through the gate and turn right into the walled lane, following the green "Waterfalls Walk" sign "Beezley". Continue along the lane, through a kissing-gate and continue along the lane. Go through another gate and drop down in front of two farmhouses. Where the road bends around to the right, go straight ahead through another gate following the green "Waterfalls Walk" sign, all the while keeping all farm buildings (Twistleton Hall) on your right. Continue ahead for another 30 yards and go through another gate and follow the path out into the field keeping to the left of the wall, again following the green "Waterfalls Walk" sign. The path leaves the wall and straight ahead the car park and entrance at Ingleton caves can be seen on the opposite hillside. The path bends around to the left and straight ahead Ingleborough can now be seen in the distance. The path winds its way down across the field to a lane. Cross the lane and continue straight ahead down towards the river in the bottom. 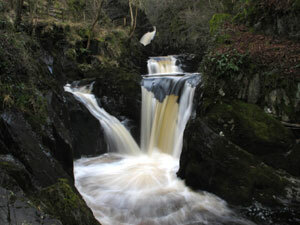 The road here is again signed Ingleton Waterfalls "Beezley". The road passes through a small caravan site and heads for Beezley Farm. The track bends around to the right, following the same "Waterfalls Walk" sign. The path goes through a few farm buildings for about twenty yards, before turning left heading back down towards the river. Go through another metal gates then through a wooden kissing gate another forty yards on. Immediately through this gate, the Beezley Falls are visible. Continue down the man-made steps, and follow the path around to Rival Falls and Snow Falls. The path around all these falls is very easy to follow, although great care needs to be taken, as it can become very slippery. Continuing around the next bend, the water is very wide and seemingly slow moving where it can be seen to converge at the mouth of the top of the steep sided gorge. Just after the start of the gorge, there is a footbridge that can be walked down to, which is an excellent viewpoint back up the gorge. Return to the main path and carry on downwards. The path continues down past Snow Falls, then onwards to another footbridge where the river is again crossed. The path bends around and after a couple of hundred yards almost meets the water. Here the path veers off to the left away from the water into the trees. Continue along this path through the trees past a small stone building, where the path emerges from the trees. Continue on down to and through a kissing gate and along the path. Ingleton is now visible directly in front. The path widens upon reaching a disused quarry, then narrows on passing through a metal gate. This leads onto a road which is followed back into the village centre. On reaching the one-way system, turn right into the road against the one-way traffic and follow the road around to the left with the railway viaduct again visible ahead. Follow the road past the Three Horseshoes Public House, under the railway bridge, and turn left back into the car park.